1 of 4 Heat olive oil in large, nonstick skillet over medium-high heat. Add garlic and cook 1 minute, until golden. Stir in tomatoes, wine, salt and red pepper flakes. Simmer, uncovered, 5 minutes. 2 of 4 Add shrimp and simmer 5 minutes, until shrimp is cooked through. Stir in parsley. 3 of 4 Meanwhile, cook pasta following package directions. 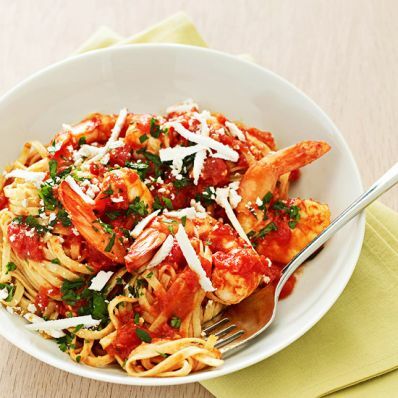 4 of 4 To serve, toss pasta with shrimp and sauce. Sprinkle with ricotta salata. Per Serving: 9 g Fat, total, 52 g carb., 40 g pro., 456 kcal cal., 708 mg sodium, 3 g fiber, 3 g sat. fat, 307 mg chol.